Had cataract surgery on my left eye on Monday; today’s Thursday. The vision on my left eye is now fantastic–better than it’s been in decades, and I’m so excited! I’m being very careful of the eye–keeping the plastic shield in place, using sunglasses, not bending over. Everything I’ve been told to do. I was good, though–I wore all the protection, didn’t run, stayed close to the barn. And Galahad was wonderful, despite the fact that he’s been in a stall all week because of an abscess (he had to stay where someone could look after him and soak/treat the foot, which I am not able to do). He clearly wanted to run and leap around, but he has such good manners that he didn’t even try. 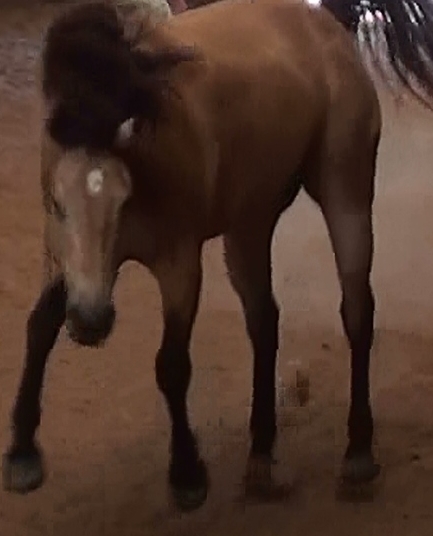 I did turn him loose in the small arena, though, and stayed there while he ran around. Probably not the smartest thing I’ve ever done, eh? He and I are used to liberty work and dancing together in the arena, but I hadn’t considered the fact that I currently have no depth perception. Since the surgery, my right eye has simply given up trying to see anything. Having 1100+ pounds of horse careening in your direction is NO fun at all when you can’t be sure exactly where he is. Surprise, surprise, Kay…. So we’ll put off our dancing for a few more weeks, until the second eye is healed up. Meanwhile, we can hang out together in the pasture. That will be just fine. I’m just happy I can see him now! This entry was posted in Galahad.